On the 30th November we hosted the second of our annual data events in London, held at the offices of Grant Thornton. Thank you to all who attended. We hope that everyone left with a little more information and inspiration on how/where to go/get started with their data analytics strategy. Our three speakers for the day were DataConsulting Managing Director Robin Clough, Matthew Porter from Grant Thronton and Philipp Kiencke from our partners dab. Robin kicked off the presentations by comparing data analytics to football, with his talk ‘Data Analytics – The Game Changer’. Taking elements of the People – Process – Technology framework and how these important elements work together to make a successful team and winning formula. Matthew followed this up with a presentation on data visualisation, showing how powerful data can be when you know how to get that message across. Finally, Phillip told us about ERP systems and getting access to data and give a very quick overview of ACL GRC. The unintentional theme of the day seemed to be that it’s not the tool but the people that are the real power behind data analytics and investment in their training and development is more important than buying the most powerful piece of software, if it’s going to remain underused. 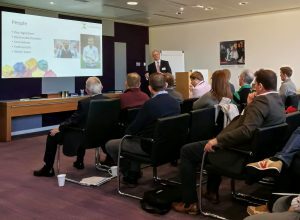 We look forward to running more of these types of events in future, which, along with our breakfast meetings in Wakefield, are becoming a fixture in the data calendar and proving to be a very popular way for sharing knowledge and ideas.